We are engaged in offering Furniture Cleaning Wipe. 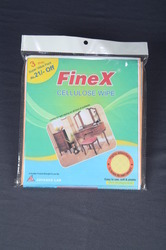 In order to meet excellent quality standards, we are supplying Furniture Cleaning Wipes. These Micro Fibre Cloths are great new invention is perfect for cleaning almost everything. Home, Car, Office, janitorial, Boat, Removes wax without scratching, Absorbs water like a leather Chamois, Pickup dust like magnet. - Re-usable /Washable/ Disposable Wipes are extra thick, strong, absorbent and durable. These superior quality wipes are made with super absorbent technology. Useful for complete cleaning of Household items, Furniture, electronic Items, Cars, Computers, Leather items, Glassware, Kitchen and Kitchen appliances, utensils etc.